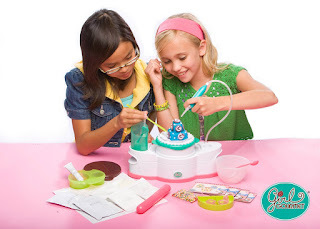 Did you have an easy bake oven when you were a kid? I did and of course Ashley ended up with one when she was old enough as well. She liked it but complained because it didn't make "pretty" food. She is quite the foodie, so how food looks is a big deal to her. She loves to cook and making things pleasing to the eye as well as the taste buds is one of her favorite things. So, she was naturally thrilled when we received the Girl Gourmet Cake Bakery to review. All it took was Ashley seeing Duff Goldman on the box to get excited. You know Duff right? From Ace of Cakes? She just knew she would be putting out cakes every bit as beautiful as his creations in no time flat! We tore into the box and went to work. Basically you mix the cake mix up and microwave to bake. Then you make fondant, roll it and add it to your cake. Throw in some gel icing and you are looking at an edible masterpiece! It was easy to put together, the directions were clear, and I was very pleased with this product. Ashley loved it and I did to! Toys that encourage creativity are my favorites and this set certainly does that! We give it two thumbs up. So, keep this in mind for the special little bakers on your Christmas list. I am sure they will love it just as much as mine did! 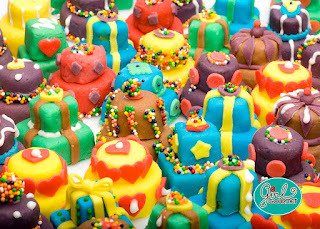 I love this idea, but I feel robbed, because I never had fondant with my EZ Bake Oven.